On round 2 with the church path open, you can shoot down a plane that is glowing red and get the a piece between the footprints at excavation. Kill the first Panzer and he will drop it. 4. Build staff under excavation. 5. Feed around 30 zombies using the fire staff in Agartha on the fire grates near the cauldrons until they are all lite up and on fire. 6. Go to church and use the chart above to shoot the fire staff at the corresponding numbers matching the torches in the tank station area. 7. Turn the circular stones under excavation to match all red. 8. Shoot the ball with the fire staff. 9. 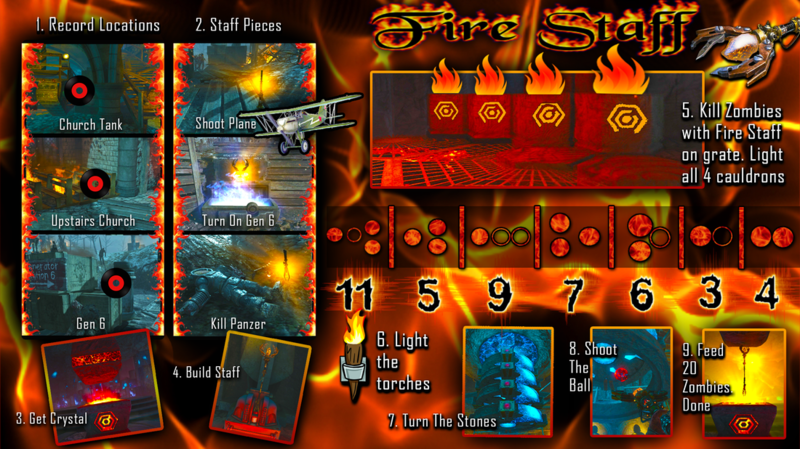 Place the fire staff in the pedestal in Agartha and feed 20 zombies and it will be complete. On the ledge next to Stamin up. On boxes near Gen 5 entrance. All three pieces are in the 3 different robot heads. You will have to teleport through each of the robots to collect them. 5. Shoot spinning stones in Agartha. It helps to imagine you are spelling the word F I L L. The symbols match up and resemble those letters. Stand close to the AK74U to see the sequence. Use the chart above to see the correct symbols. Generator 4 use the wind staff and shoot the dome towards excavation. Past the church tank track shoot the dome toward excavation. Near entrance of Generator 5, shoot smoke dome towards excavation. 7. Turn the circular stones under excavation to all yellow. 8. 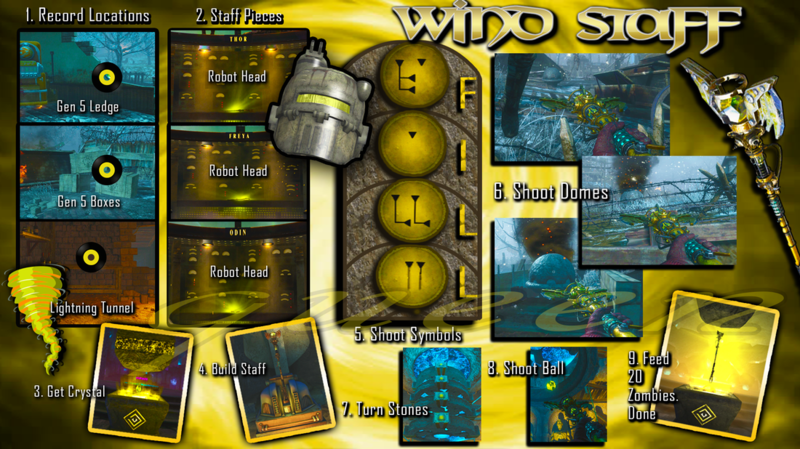 Shoot the ball with the wind staff. 9. 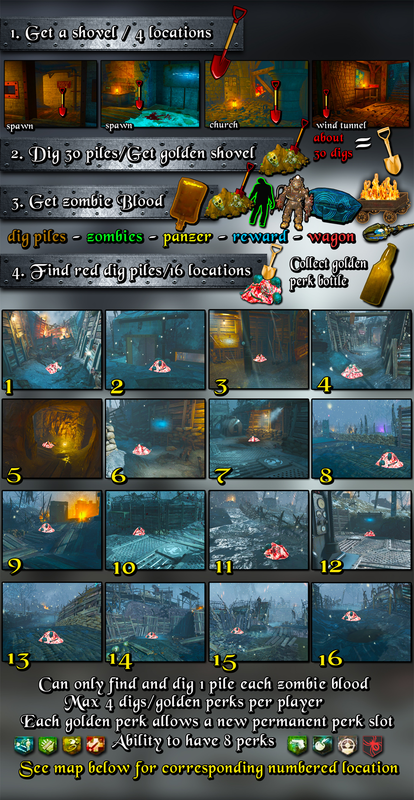 Place the staff in the pedestal in Agartha and feed 20 zombies and you are done. Jump off tank after Generator 4 and near Generator 3 onto a platform and get piece in footprint. ​3. 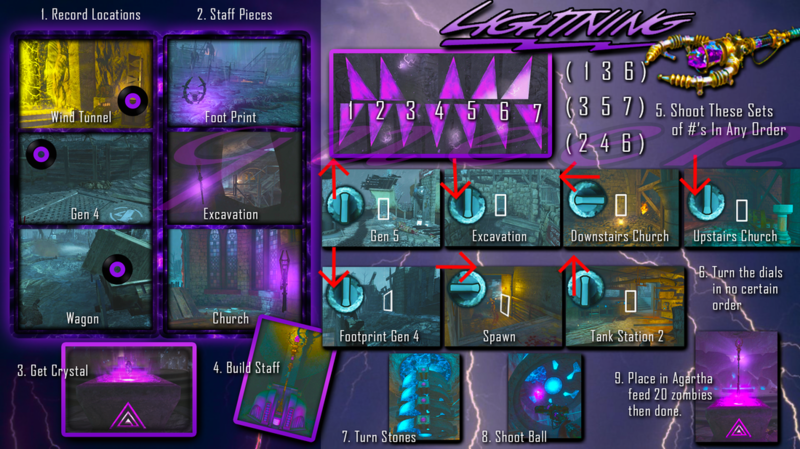 Obtain the gramophone from excavation, head to Lightning tunnel and get the crystal (Gen 5). 5. Shoot the corresponding numbers on the piano that are on the chart above. They do not need to be in any certain order. 6. Turn 7 dials around the map to the correct position as indicated in the chart above. 7. Turn the circular stones under excavation to all purple. 8. Shoot the ball with the lightning staff. 3. Obtain the gramophone from excavation, head to Ice tunnel and get the crystal (Gen 6). 5. Shoot the corresponding patterns in Agartha with the Ice staff to turn the stones in the air correctly. Use chart above for correct matching symbols. 6. 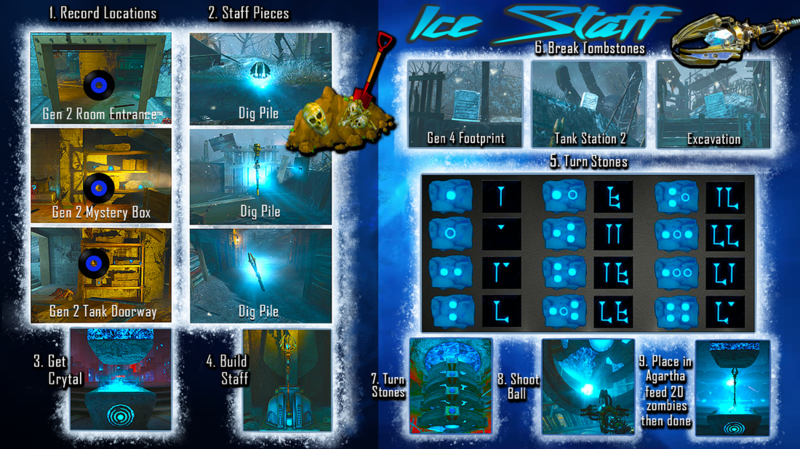 Shoot 3 tomb stones with Ice staff to freeze and then use a bullet gun to break stones. Locations are in chart above. 7. Turn the circular stones under excavation to all blue. 8. Shoot the ball with the Ice staff. How To Get A FREE Pack A Punched MG08 "Magna Collider"